There is an argument going around the Internet that says that Google has its days counted. Basically these people argue that you can not search the Internet algorithmically. That is, you need to have some human input in the process if you want to make sure that the results are relevant. Following that spirit with also have a myriad of human or community powered search engines emerging these days. Last week I came across Topicle, which is a pretty interesting one. Basically users can create sub-search engines, hand picking the URLs that should be considered for a given topic. Suppose you know all the cool sites that deal with digital photography. You could go there and create a search engine called “Digital Photography” and specify the URLs that should be used on the search queries. In a matter of seconds the search engine is functional and you and the other users can use it. 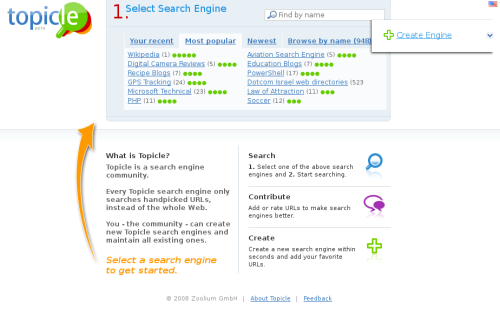 Topicle is an extra layer with a Google Custom Search Under the hood. Its started by an ex-Googler and who knows down the line this may be Google’s way of entering the vertical engines fray and making a big name.